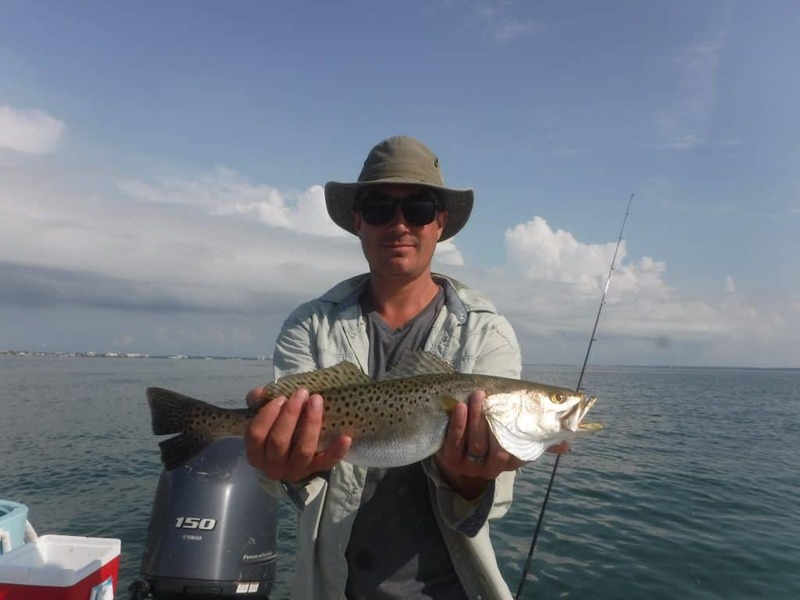 Anglers doing some Sarasota fishing can expect action and variety on the deep grass flats. Summer is a great time of year to fish here on the west coast of Florida. 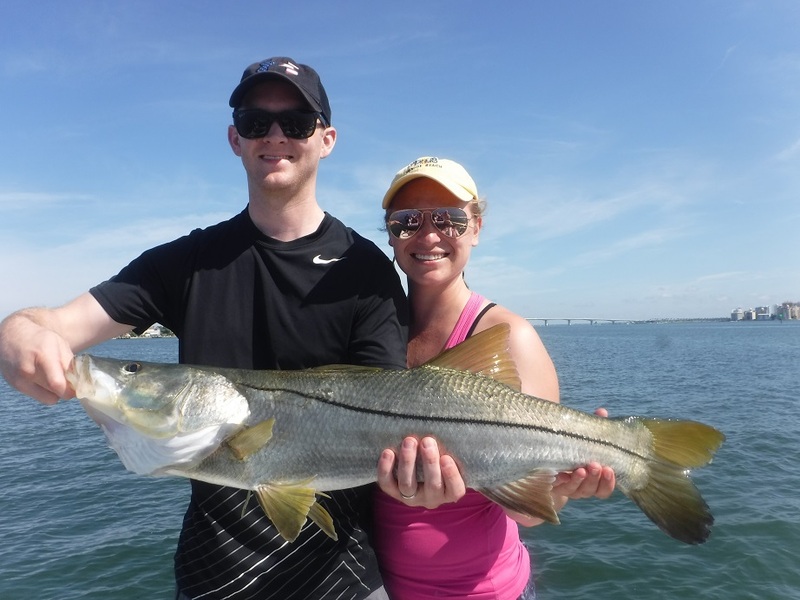 Many different species are landed by anglers Sarasota fishing, especially in the warmer months. 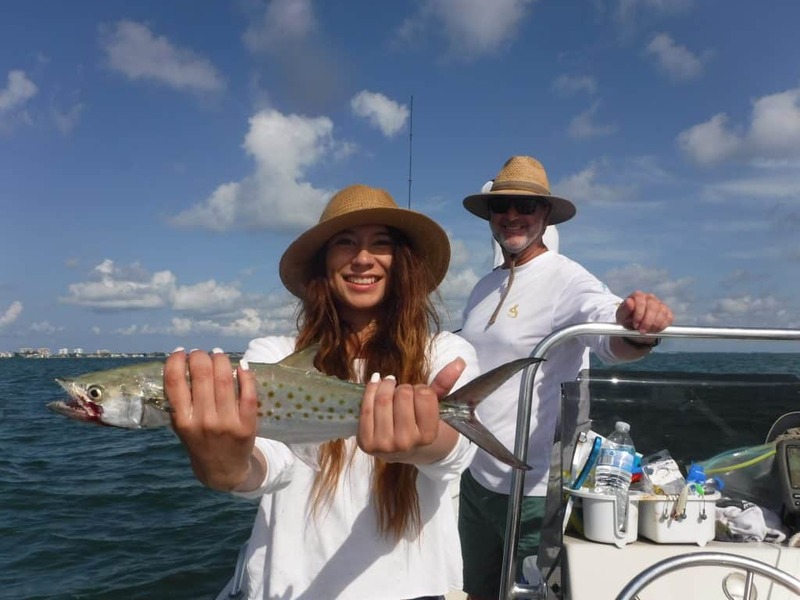 Speckled trout, Spanish mackerel, jack crevelle, bluefish, pompano, mangrove snapper, gag grouper, cobia, ladyfish, and sharks are taken on the deep flats. Snook and redfish are available in the passes and nearby flats. 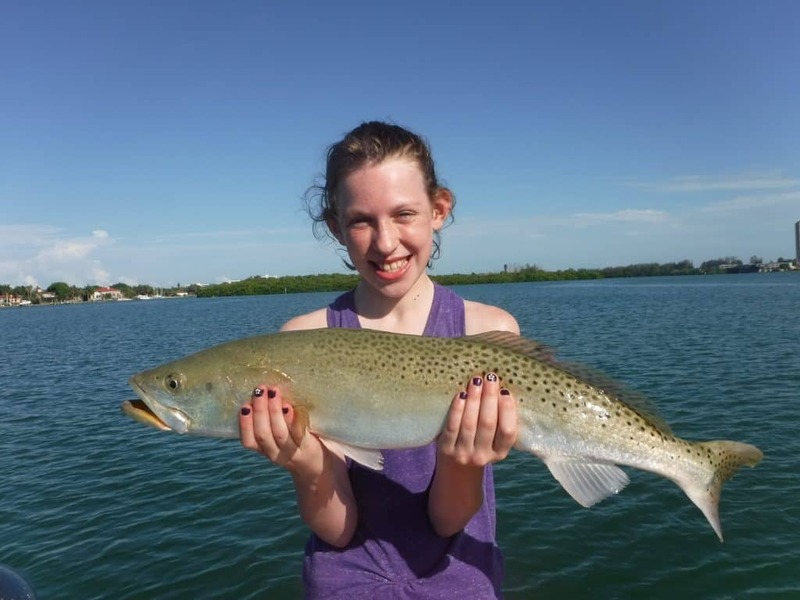 Summer is a great time to do some fishing in Sarasota! The morning dawned clear with a light southeast wind. Perfect conditions for summertime fishing! I met my clients at the ramp at Centennial Park in downtown Sarasota. Pilchards are abundant and easy to net first thing in the morning. In short order the live well was full of frisky bait. After another short run, I anchored up on the edge of a shallow grass flat near Big Pass. For the next three hours we experienced non-stop action on speckled trout, Spanish mackerel, jack crevelle, mangrove snapper, gag grouper, a cobia, bluefish, ladyfish, sail cats, and small sharks. The west coast of Florida is famous for great fishing. Glamour species such as snook, redfish, and the mighty tarpon get a lot of attention from anglers, and for good reason. However, many of my charters include novice anglers who really just want to bend the rod and catch a bunch of fish. The deep grass flats in Sarasota are a great place to do just that. I find the flats adjacent to the passes to be the most consistent summertime spots. Bird Key, which is across the channel from Lido Key, produces a lot of fish on my charters. It is an area that has seen a lot of dredging resulting in flats that drop off sharply into deep water. The combination of depth change, current, and abundant bait attracts and holds game fish. The Radio Tower and Middlegrounds flats are close to new Pass and are also excellent spots to fish. Early morning is usually the best time to fish, especially on a high tide. Rigging is very basic on my Sarasota fishing charters. Use a spider hitch to double 3’ of the running line and use a double uni-knot to attach 24” of 30 lb leader. If this seems a bit much, simply tie a small black swivel to your running line then tie on the 30 lb leader to the swivel. 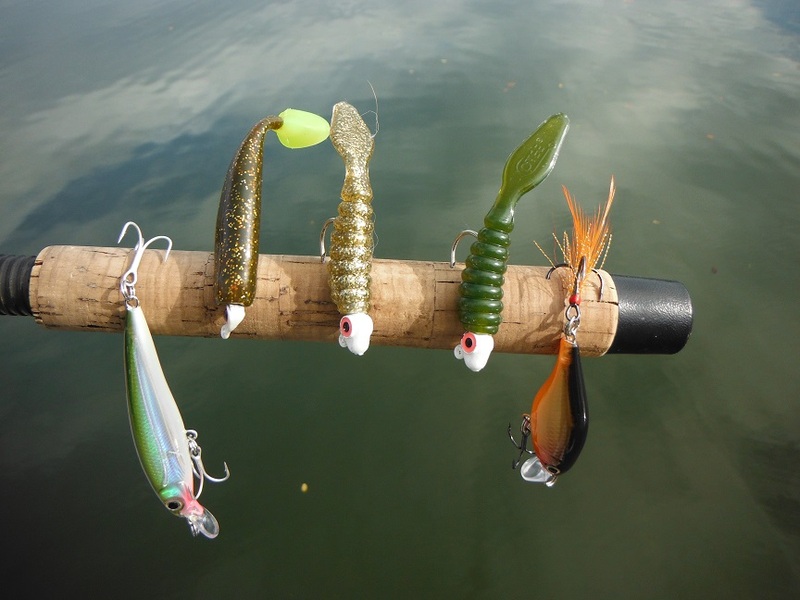 Attach a hook or artificial bait onto the end of the leader and you are ready to fish! This system works very well no matter what lure or bait is being used. Live bait is tough to beat for both action and variety. 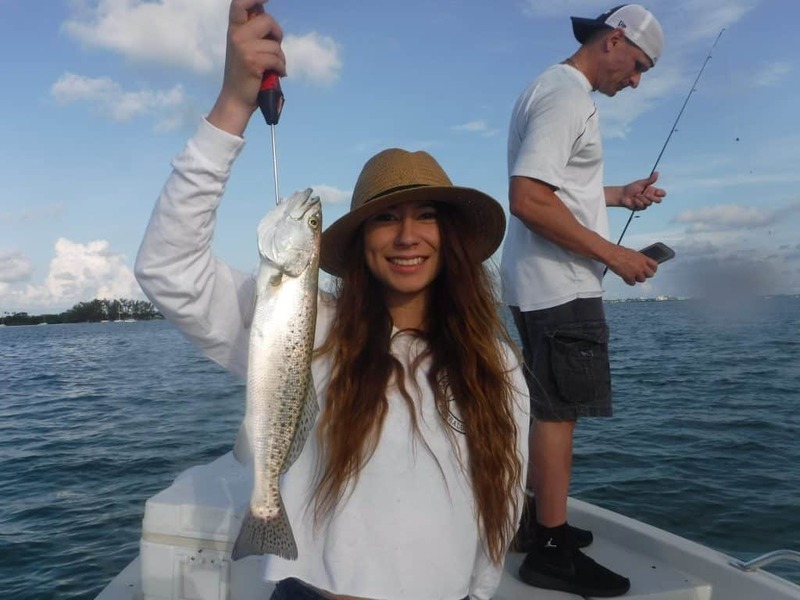 A live shrimp fished under a popping cork in four to six feet of water over a grassy bottom is a tried and true method to catch a bunch of speckled trout, along with just about every other species in Sarasota Bay. Tie a 1/0 live bait hook onto the leader then attach a “popping cork” on the line three feet above the hook. When drifting in water deeper than six feet, I prefer to just free line a bait out behind the boat. Shrimp are the most popular live bait. They are available at most local bait shops, are easy to keep alive, and everything eats them! 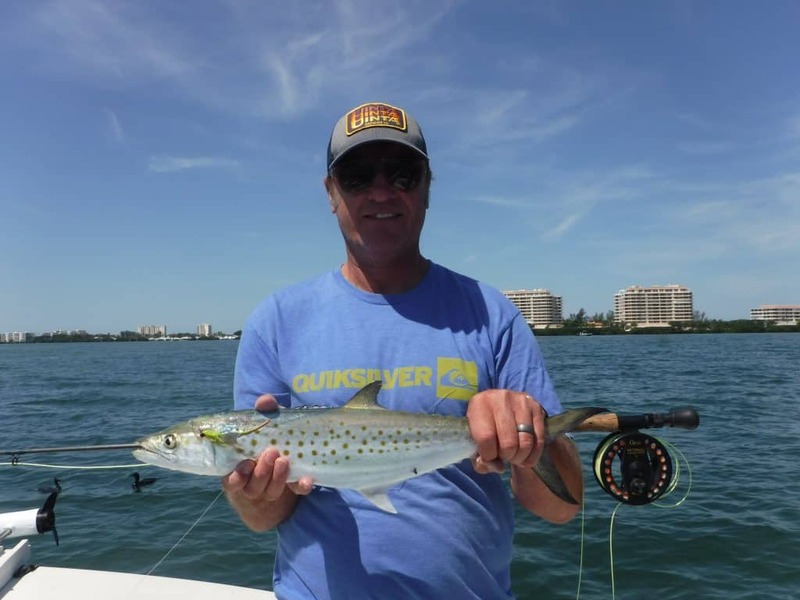 Live bait fish are extremely effective in the summertime for anglers on fishing charters. Pinfish, grunts, and whitebait, (pilchards and threadfins) are the predominant bait fish in our area. A cast net is required for the whitebait. Cast over visible schools of bait or anchor and use chum consisting of jack mackerel and wheat bread to lure the bait within range. Pinfish and grunts can be caught with either a hook and line or a cast net. Catching and keeping bait fish alive is more time consuming, but can pay off big time. One very popular technique is “live bait chumming”. This requires a LOT of whitebait, but practically guarantees success. Simply anchor up tide of a likely flat and toss out handfuls of bait at five minute intervals. I usually squeeze the bait before throwing them in, this causes the bait to swim erratically on the surface. Game fish will be drawn in and the action will be non-stop! A jig/grub combo is by far the most popular artificial lure on the west coast of Florida. A ¼ ounce jig head with a plastic grub is a deadly bait when fished over the grass flats. I prefer Bass Assassin baits; gold in clear water and rootbeer or olive in darker water. Don’t let the myriad of colors and styles confuse you, they all either imitate shrimp or baitfish and are for the most part fished in the same manner. Cast the jig out, allow a few seconds for the it to sink and twitch the rod tip sharply. Let the lure fall on a tight line, most strikes occur as the bait is falling, the helpless look triggers the bite. Keeping the rod tip at ten o’clock and allowing the jig to fall on a tight line will allow anglers to feel more bites. Grubs with a shad tail or curly tail that mimic baitfish can be worked with a steady retrieve. Scented soft plastics such as Gulp! baits are more expensive but can make a difference on days when the fish are a little fussy. Plugs are another great choice for anglers who prefer to cast artificial lures. Rapala X-Raps in the (08) size are my personal favorite. They cast well and have great action. Cast the lure our and retrieve it back to the boat with sharp twitches followed by a short pause. As in all lure fishing, vary the retrieve until one is found that produces strikes when Sarasota summer fishing! I was unhooking and releasing a small trout for Jesse when I saw Lily bowed up and heard the drag squeal in protest as a decent fish made a couple of short runs. The mystery was solved shortly as a huge speckled trout came into view. Riding on the line was a hand-sized pinfish. Obviously, the pinny hit the pilchard and the big trout ate it. Lily fought the fish gently and with patience and I slid the net under it, hoisted it up for a quick photo, then released it to live and breed, those big trout are the future of the fishery. For anglers seeking fast action and variety, the answer is easy, and to some a bit surprising; summertime! I have fished with the Derry family from the UK several times, and like many of my clients this time of year, they do not fish a lot at home. I need to be able to put them on a bite that is both productive and easy for novice anglers. Chumming the deep grass flats meets both of those goals when Sarasota summer fishing. In many fishing situations, the heat of summer can be a tough time to go at it, but not so here in Sarasota, Florida where I guide. Despite water temperatures in the upper eighties, action on the deep grass flats in Sarasota Bay is usually fast and furious. The reason for this bonanza is simple; bait, and lots of it! Speckled trout are probably the most commonly caught species in Sarasota Bay, but Spanish mackerel, bluefish, mangrove snapper, jack crevelle, juvenile gag grouper, flounder, sea bass, ladyfish, sharks, and more will respond to this technique. Each year is different, but generally speaking, by the first part of June the baitfish show up in big numbers. They are small at first, but grow quite rapidly. Large baits are not needed, or even preferred, for this type of fishing. As long as they are large enough to cast, the gamefish will readily devour them. Smaller baits also make good chum as the fish won’t get filled up as quickly. Just about every shallow grass flat and bar near either Big Pass or New Pass will have schools of bait. 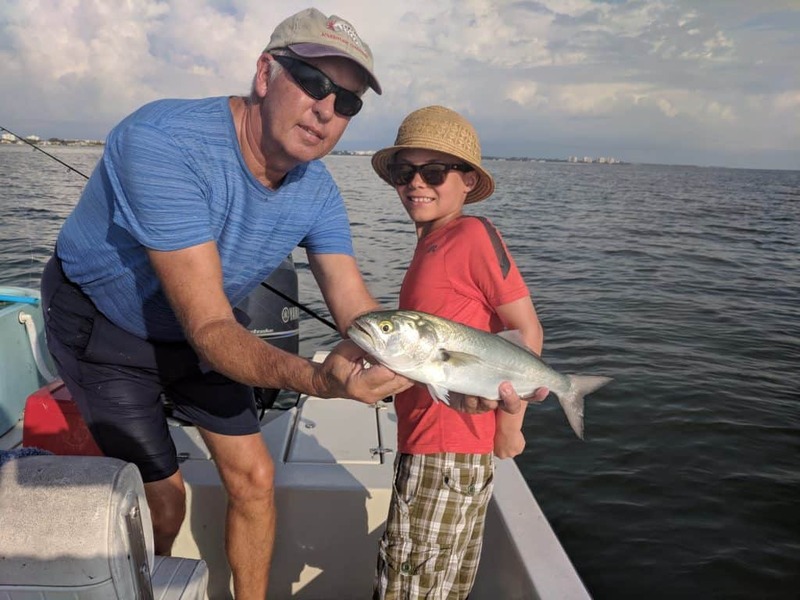 Scaled sardines, AKA “pilchards” are the preferred bait, being a bit hardier, but threadfin herring can also be abundant as well and are extremely productive on Lido Key fishing charters. The technique of chumming with live bait over the deep grass flats is relatively simple and straight-forward and will work just about any place where large quantities of baitfish can be easily acquired and kept alive. The most important requirements are a large livewell with a good pump and the ability to throw a cast net. There are a lot of videos available online that can teach the art of casting a net, so I won’t get into it here. Once the well is full of frisky baits, angling success is virtually guaranteed for clients! The best time to catch bait is in the morning on an incoming tide. The current tends to position the bait on the up-tide edge of a flat or bar. Often times they can be seen dimpling on the surface. When this occurs, the boat is eased up to them and then the net is cast over them. On cloudy or breezy days, the bait can be more difficult to locate. A chum mixture of cat food, canned mackerel and bread, or even tropical fish food can be used to lure the bait into range and get them knotted up in a bunch. Bait will be thick on the beach at times, but boat handling can make catching them a tricky proposition, so be careful when taking that approach. I prefer an 8’ net with ¼” mesh. The mesh size is very important since our baitfish are fairly small. Using a larger mesh will result in a lot of bait getting “gilled”; in other words stuck in the net. Be careful not to over load the well, particularly when the water temperature is high. Once the well is loaded, or “blacked out” as we say here, it is time to go fishing. Tackle requirements are very basic. A 6 ½’ or 7’ spinning rod with 10 lb line is an ideal outfit. I prefer monofilament line when using live bait; I believe that the stretch in the line is actually beneficial. A 24” piece of 30 lb. fluorocarbon leader is attached to the running line using either a #10 black swivel or using a double uni-knot. A #1 or #1/0 short shank live bait hook finishes off the rig. Anglers may choose a small circle hook as well. A long shank hook will help prevent cut-offs in the event that Spanish mackerel or bluefish show up in the chum. The next decision an angler must make is where to fish. Choosing a flat where the wind and tide are moving in the same direction will generally be the most effective situation. Find such a flat that has good signs such as birds working, fish breaking, or schools of bait on the surface and chances of success will be very high. If no visual signs of fish are found, simply choose a flat that has been productive in the past. In my area in the summer, I look for clear water and lush grass in 6’ to 8’ of water. Anglers can see a map with great fishing spots. There are some nuances to chumming; it is not as simple as shoveling bait out behind the boat. The idea is to attract fish and get them excited, not to fill them up. Start with just a dozen or so baits and see how the fish respond. Squeezing the baits slightly will injure the bait, making them even more attractive. The less chum that can be used to keep them behind the boat, the better. Strong currents will require more chum, slack tides less chum. Some days they just “want” a lot to keep them wound up. Some species such as mackerel and ladyfish like more aggressive chumming than trout do. Don’t overlook the baits that die in the well, mangrove snapper often times respond well to it. Casting topwater plugs for snook and tossing crabs at rolling tarpon is challenging and very exciting. But, there are times when the goal is just to go out and catch a bunch of fish. Chumming with live bait is a deadly technique that is guaranteed to put smiles on the faces of anglers! Get out there and enjoy some great Sarasota summer fishing!